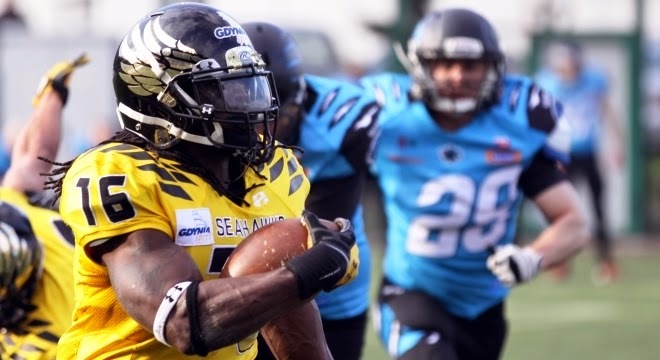 One of the most talked about games this past weekend in Europe was definitely the PLFA Topliga Gdynia Seahawks vs Wroclaw Panthers. Both teams are pretty much on the same level, however, Gdynia managed to win with an 8 point difference. This game was important for one import in particular - the dual passport RB/DB Tunde Ogun. There was a lot of noise if Tunde is or is not an extraordinary athlete. Ogun had an outstanding performance, and was named the game MVP. There is a reason why an athlete or a coach gets the TDEU Approved status. "My first game in Poland was MORE then memorable! To dominate a top contender, give the fans a show, see my teammates play at a high level and win MVP honors afterwards is a very humbling and rewarding experience. I'm looking forward to the rest of the season and seeing this team do some very special things!" -says Ogun. In the first half of the game - McCrea was ejected. After a hit, officials called the unnecessary roughness, and it might cost McCrea participation in the 2nd game of the season.